Trappro humanely removes birds that have gained access to your attic, walls, shed or other areas of your home. Birds including pigeons, starlings, sparrows and woodpeckers will be trapped and removed. 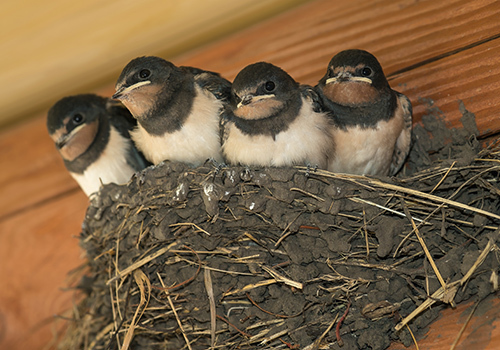 Bird nests, droppings and other messes made by birds will be safely removed from walls of your house, attics, sheds etc. Dead birds or baby birds will also be carefully removed if found in your home in Maryland, Washington DC or Northern Virginia. Our professional trappers will also be able to seal up holes in attic or walls including fireplaces and vents where birds have entered the home. Trapping and exclusion of birds is available for homeowners and business owners throughout Maryland, Washington DC and Northern Virginia. Description: Birds are a subgroup of reptiles, Birds can be characterized by feathers, wings evolved from forelimbs, toothless beaked jaws, high metabolism, a 4-chambered heart, and a lightweight skeleton. Many species annually migrate great distances. Birds are social in their communication, breeding, hunting, and flocking. Food Sources: In the wild, a bird's diet usually depends on its size. Birds like sparrows and finches eat seeds , worms and other small invertebrates, as well as insects like crickets or mosquitoes. There are so many types of birds out there that have each adapted to the power of flight a little bit differently. Baby birds rely on their parents to feed them. Parent birds, either one or both, leave their young in nests and return with food already digesting in their stomachs. The parents then regurgitate the food to feed their offspring. Life Span & Reproduction: Birds reproduce by internal fertilization, which means the egg is fertilized while inside the female. The hard-shelled egg develops within the female with a thin membrane forming a closed sac around the embryo. The eggs are typically then laid in a nest. Bird eggs come in many different colors in an effort to camouflage them from predators. For additional protection, different bird species build different style nests. Some are more elaborately shaped, while some birds skip the entire nest and lay their eggs on a cliff. The birthing process for birds bases much off of the avoidance of being preyed upon. Likewise, in very general terms, the larger a bird is, the longer it's life expectancy. For small birds, the average life expectancy may be as little as two years. This short life expectancy is due to the many hazards birds face from birth. These hazards include, but are not limited to, predators, diseases, accidents, migration, starvation, habitat loss, and hunting. Some individual birds have survived surprisingly long, including a cardinal (13.5 years), a black-capped chickadee (10 years), and an American goldfinch (7 years). There have been woodpeckers to survive in the wild for 20 years. Many waterfowl have longevity records between 30 and 40 years. Captive birds, protected from the hazards of nature, have much longer life spans. Typical Areas of Entry: Birds tend to enter the structure through openings in bath vents, kitchen vents, dryer exhaust vents, gable vents, damaged soffit, and more. Birds can even be heard chirping in the chimney. Birds known as chimney swifts like to build their nests inside the chimney flue to allow their babies a safe, warm place to make their entrance. Unfortunately, they are federally protected and cannot be touched. Approximately 2 to 3 weeks after the chirping begins, the swifts will be independent enough to leave their nest. Lighting your chimney in an attempt of removal could result in working against you even more so. Hot embers can be carried up the thermal column into the flue and land within the flammable nesting. The burning nesting material could possibly fall on to the roof or - even worse - into an opening into your attic and cause major fire. Clogged vents will fail to exhaust properly causing fan motors to overheat which could potentially lead to similar problems. Typical Treatment: First, a thorough inspection by a Trappro technician will be completed, area(s) of entry will be identified, and repair/sealing recommendations will be established. The technician will explain which areas need to be sealed and the best ways to go about doing so. These repairs should be made in direct conjunction with the installation of an "exclusion trap" when the situation allows. Exclusion traps are one-way doors which allow smaller wildlife (unable to be caught in a live trap) to escape an enclosed area with no allowance for re-entry. In order to assure no re-entry, ALL existing openings will need to be permanently sealed, leaving a small gap for trap installation only if applicable, IMMEDIATELY BEFORE the trap is secured. By closing off all existing entry points and installing a fabricated exit, the birds will be limited to one way out with no way back in. Trappro recommends leaving the exclusion trap on the home or structure for approximately 2 to 4 weeks, dependent on climate temperatures and such, in order to assure that all birds have made a successful escape. Once the trap is removed, the trap site is then permanently sealed as the rest of the structure is. Damaged vents should be replaced and properly screened, open chimney flues should be capped, and accessible droppings should all be removed. These services are included in the many that Trappro technicians are trained and able to complete. Dangers: Bird nesting and droppings left behind can lead to serious health problems for humans and domestic animals. Pest birds can harbor over 40 types of parasites and host internally over 60 types of infectious diseases that can be spread. Humans are most at risk for infection when dried bird droppings become airborne. Physically touching feces doesn't touch the risk associated with inhaling what is traveling through air vents and open windows. Infections and diseases associated with birds include, but are not limited to, histoplasmosis (a respiratory disease that can be fatal), cryptococcosis (begins as a pulmonary disease and may damage the central nervous system), e-coli, and louis encephatlitis (an inflammation of the nervous system that can ultimately result in paralysis, coma, or death). In addition to being direct carriers of disease and infection, birds are associated with over 50 kinds of ectoparasites. Ectoparasites work their way throughout structures, infest, and then attack. These pests include, but are not limited to, bed bugs, mealworms, and chicken mites. Bird droppings accumulate quickly, so removal and exclusion at the earliest sign of activity is the best line of defense. Call Trappro TODAY! Have your bird intrusion on the road to resolution!